If something doesn’t sit well with you, will you be able to set aside your feelings? If your brother turned into a frog, should you turn him in to your parents? Does the principal establish the principle of the thing? And frankly, is every supermarket Express Line wrong? We’re back again with the next 5 most commonly misused words in the English language and we’re tackling some tough phrases that can be incredibly confusing. Without further delay, here they are! Incorrect: The rabid mongoose would do fewer harm if it were given ping pong paddles. Correct: The rabid mongoose would do less harm if it were given ping pong paddles. into – Expressing movement or action with the result that someone or something makes physical contact with, becomes enclosed, or is surrounded by something else. Combined with the word “turn,” into also indicates changing someone or something into someone or something else. Incorrect: She imagined turning her boss in to a newt. Correct: She imagined turning her boss into a newt. in to – The adverb “in” (expressing movement with the result that someone or something becomes enclosed or surrounded by something else) is followed by preposition “to” (expressing motion in the direction). Combined with the word “turn,” in to also indicates giving, passing, or exchanging someone or something to someone or something else. 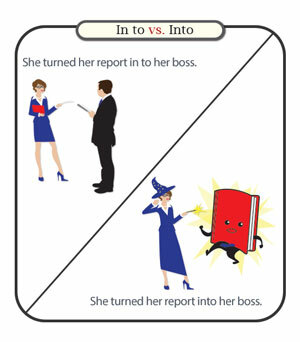 Incorrect: She turned her report into her boss. Correct: She turned her report in to her boss. past – Reference to a distance or a period of time before now. Incorrect: The tourists drove passed the large dark aardvark in the park. Correct: The tourists drove past the large dark aardvark in the park. passed – The action of passing; i.e., to move or cause to move in a specified direction to go past or across or to leave behind. Incorrect: The aardvark past the time burrowing. Correct: The aardvark passed the time burrowing. principle – A fundamental source or basis of something. principal – First in order of importance main, denoting an original sum invest or lent (money), or the person with the highest authority. Incorrect: The winners are paid from the interest without even touching the principle. Correct: The winners are paid from the interest without even touching the principal. set – To put, lay, or stand (something) in a specified place or position. Incorrect: Sit the fence post into a bed of concrete for added stability. Correct: Set the fence post into a bed of concrete for added stability. sit – To adopt or rest with the torso vertical and the body supported on the buttocks; to remain inactive or unused; to be engaged in business; or the way in which an item of clothing fits someone. Incorrect: The idea didn’t set well with Fernado. Correct: The idea didn’t sit well with Fernado. Check out Top Misused Words Parts I, II, III, IV, V, VI, and VII for more! even though we edited more than once? Or not aware at the time some are right and some are incorrect.? I know I miss the mark many times. The email you used is not connected to your account. If you have questions regarding a particular article we recommend contacting our Member Support Team so they can clarify the issue further. You can do this, by using the Contact Us button within your My.EzineArticles account. Fixing grammatical errors can be a daunting task in case one is not aware of minute grammar rules. Once you master over it you can easily spot and fix the issue easily. Not to be critical for its sake, but were you being intentionally redundant with “master over” and the two “easilys” in your post. I know it gets difficult to be grammatically correct at all times. So, I’m making this comment with the utmost humility. Master it, not over it. Easy, just one easily is enough. I cannot stand the misuse (and overuse) of the word “literally”. People seem to be using it in lieu of “seriously” or “very” to simply put emphasis on their point. It’s not being used properly, meaning “as opposed to figuratively”. For example, saying “I was literally scared to death” instead of “I was very scared!”. I doubt someone dead can speak. That drives me crazy-figuratively! Sometime, these words become crtical to use on the proper places, even a native makes mistake. Thank you for enlightening this post. I’m terrible with this lol. My grammar isn’t the best when writing (and mainly when talking), but i still know how to have my reader understand where i’m coming from – despite typos. Randall … remember that you can have a principal as a pal, but not a principle. That might help. I’ve noticed that many US writers use “loose” instead of “lose” and the term “off of” always sends a shiver down my spine. Incorrect: The rabid mongoose would do fewer harm if it was given ping pong paddles. Correct: The rabid mongoose would do less harm if it was given ping pong paddles. Incorrect: The rabid mongoose would do fewer harm if it *were* given ping pong paddles. Correct: The rabid mongoose would do less harm if it *were* given ping pong paddles. It’s the future conditional case. Since the rabid mongoose hasn’t been given ping-pong paddles in the past, and any harm it can do can only occur in future instances, were is the correct tense of the verb. Yes, most of the expert writer making like this errors, I think this blog post would be a great help professional writers to correct the same. The worst one for me is the constant misuse of ‘it’s’ and ‘its’. It seems that everyone now uses ‘it’s’ for both senses. ‘It’s’ is short for ‘it is’. That is the only time it should be used. So, ‘It’s raining outside’ is the correct usage. As long as you remember that ‘it’s’ means ‘it is’ then it should be easy to determine which one should be used in a sentence. In Mathematics, which is correct? (a) Five is less than seven. (b) Five is fewer than seven. Less is used for countable nouns as in maths ie, “five is less than seven” is correct. Yes I like so much of in this post I agree that grammar is very impotent port of writing article content. The Town Cryer or is it Crier wasCrying or Crieing because he lost the winning lottery ticket? The Town Crier or Cryer Cryin aloud or crying loudly? There are even more choices if the sentence is spun. Good article. What about the difference between “affect” and “effect”, the same with “affective” and “effective”. Fewer/Less! Drives me CRAZY! Thank you for spreading the word. There IS a difference!